Since I saw some were eating Tendon (tempura over rice in a bowl) on TV, I was dreaming of getting one, but I didn't wanna go some Japanese restaurants where non-Japanese chefs who are unfamiliar with real Japanese cuisine cook something weird or Americanized. 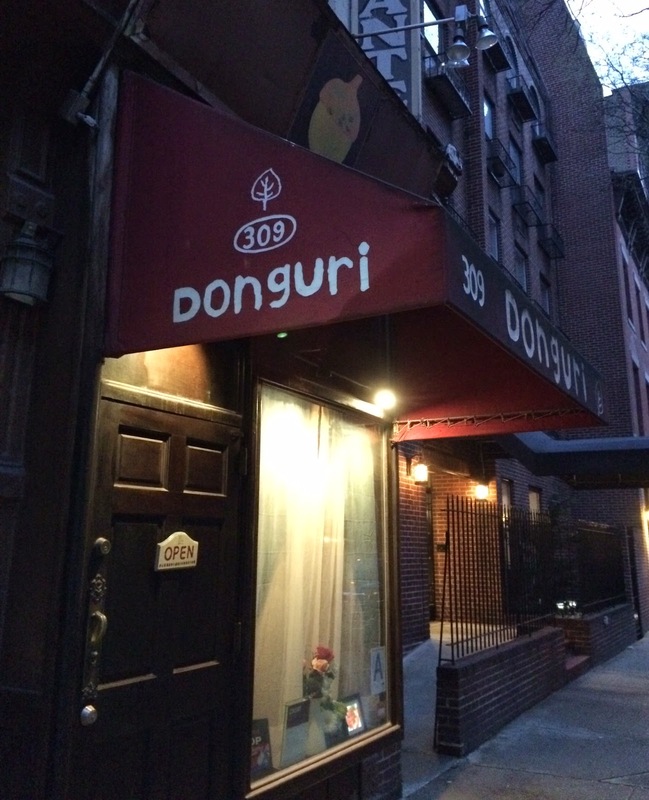 Then, my husband searched restaurants and found "Donguri" in Upper East. He called the restaurant to make sure there's a table and we headed over there right after. I actually remember seeing this spot when I was walking to MET from The Burger Bistro where I had a donut cheeseburger. "Donguri" means acorn in English. It's a very cozy space as if I had walked into a somebody's house. There're about 8 small square tables with 1 round (or either larger square) table by the window. 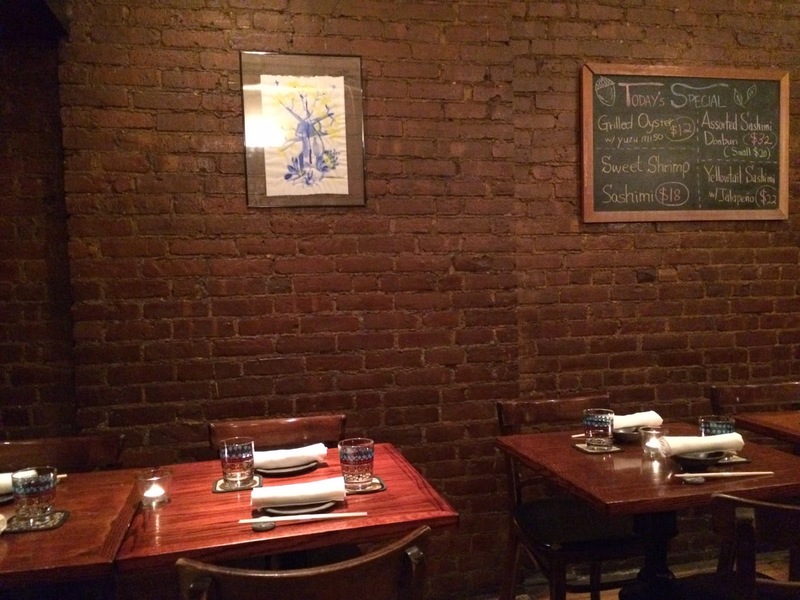 The bricked walls had a few acorn shaped decorations, and today's menu. There're 2 menu books; one for drinks and another for food. One sad thing (for my husband) was they didn't have any soda but green tea based beverages for non-alcohols. Fortunately, Peach Green Tea by Tea's Tea was fruity and not much green tea flavor, and he enjoyed it even though he doesn't like green tea. The jar on the left was soy sauce, but it doesn't mean that you need to pour all the content, but only as much as you desire. 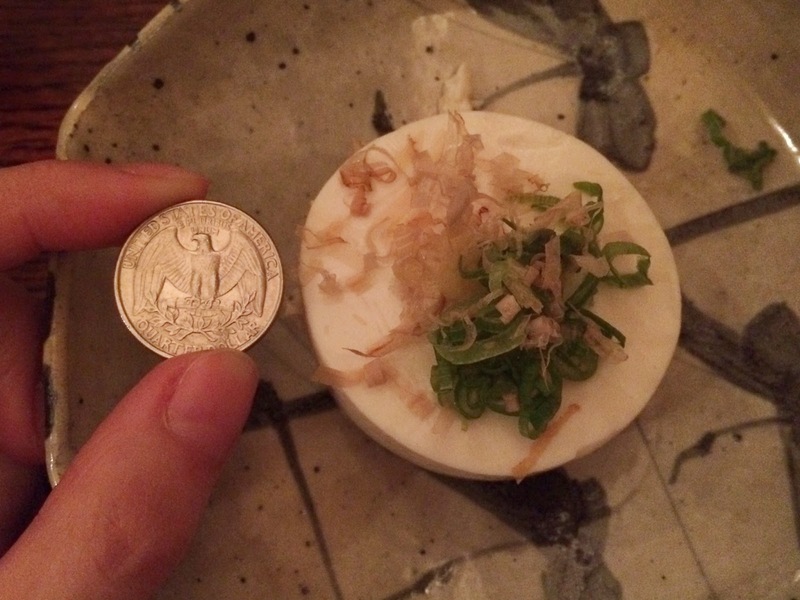 However, I recommend you add little by little as it's salty, and personally, I like eating tofu without soy sauce. I was shocked by the size for the price (7 dollars) and compare with a quarter coin, whose diameter is 24mm (0.95 inch). 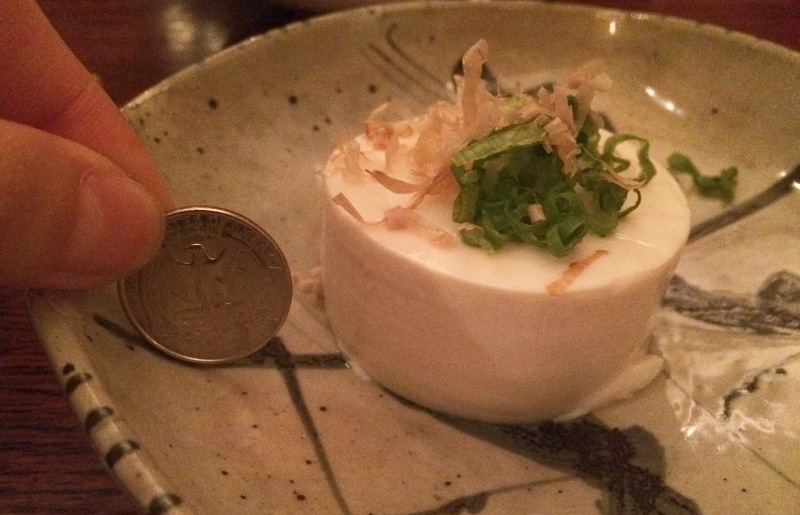 The height was barely 1.5 taller than the coin. 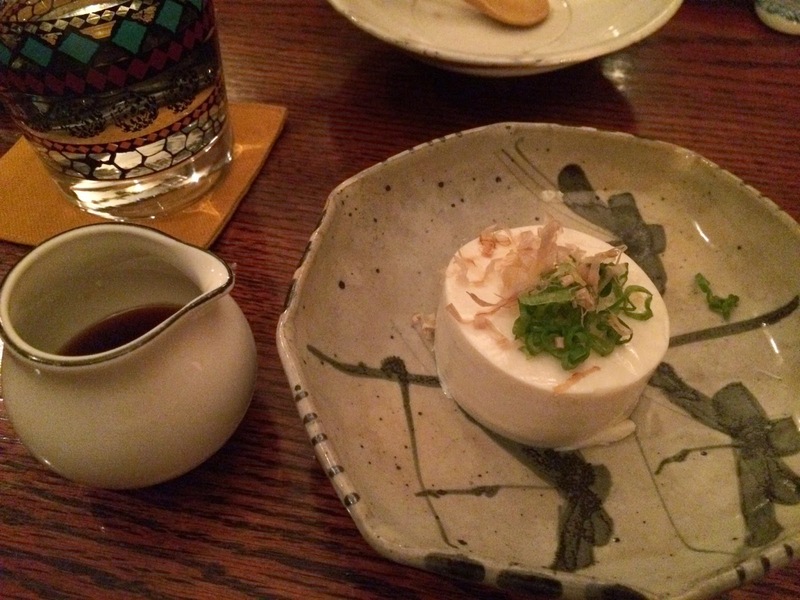 It's a silkened tofu and very smooth, and garnished with leeks and bonito flakes. 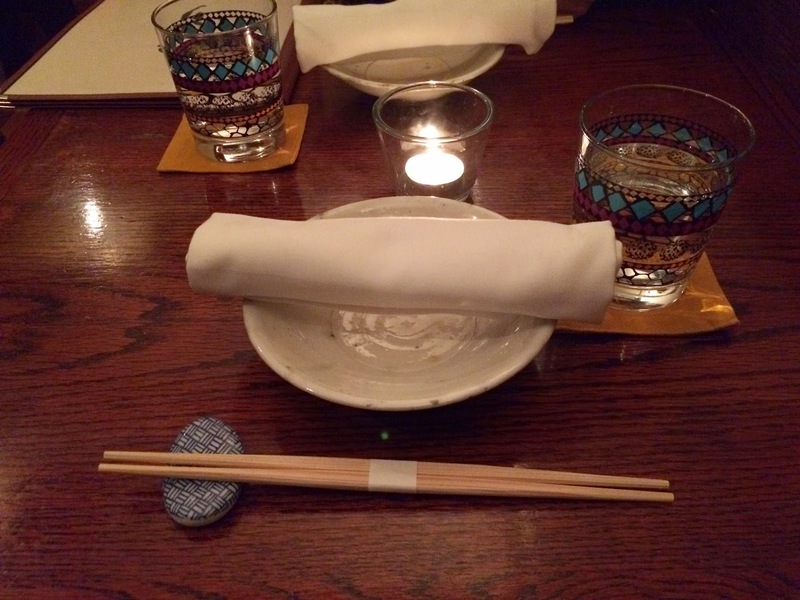 They brought wooden spoons so that if you're not uncomfortable about using chopsticks, the spoon would be useful. It's one of the famous and any supermarkets sell this dish in Japan. There're cut octopuses, wakame (a type of seaweed) and cucumbers. 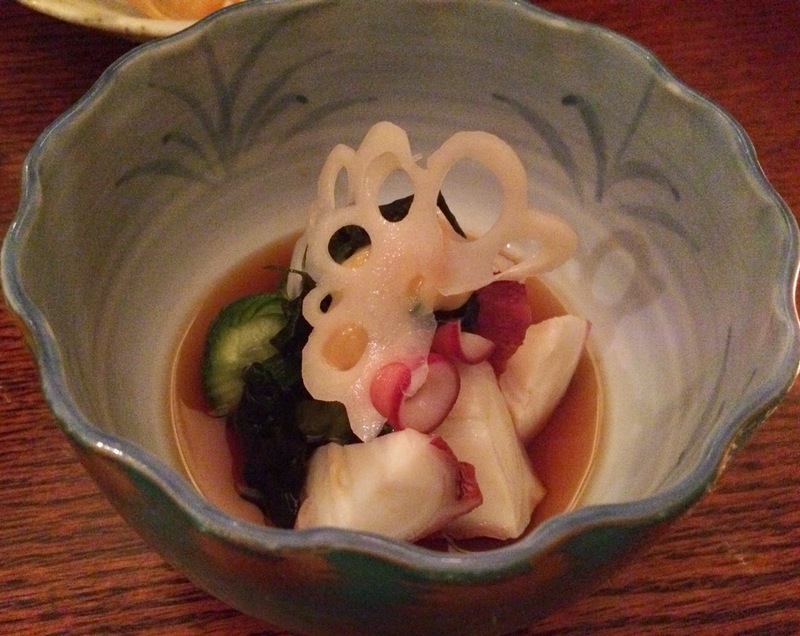 On the top, there's a sliced lotus with mix of miso and vinegar. The vinegar was mild and cucumbers were decorative cut, which looked similar to "accordion cut." 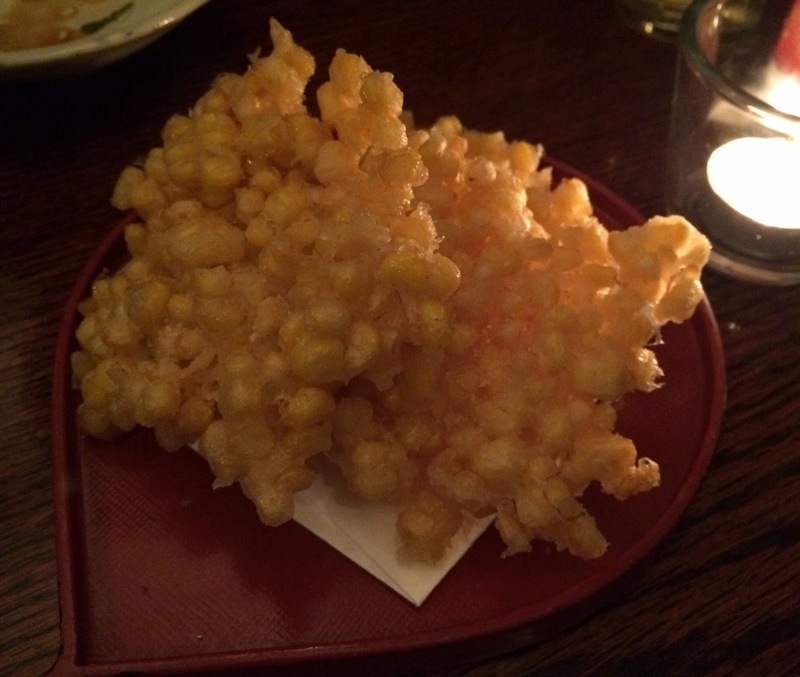 Lots of lots of corns in each tempura, and there're 3 slices on a plate. 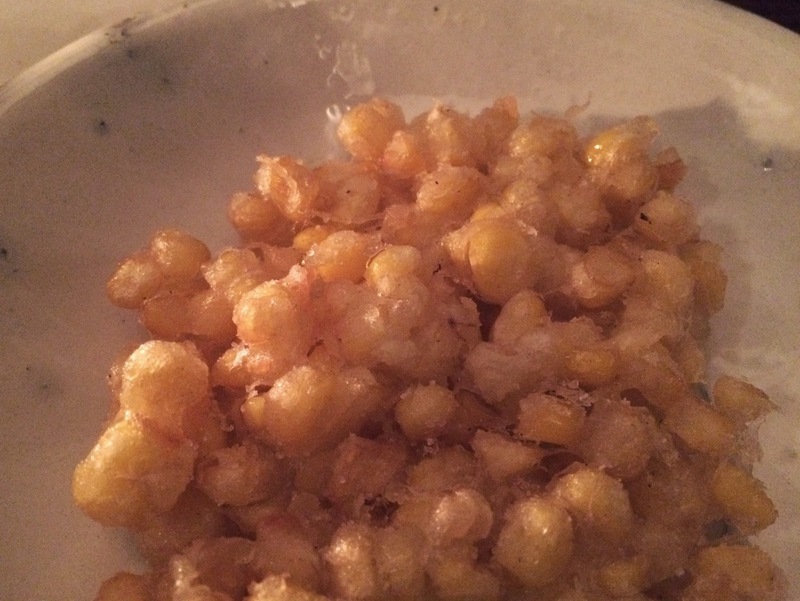 Corns were very juicy and sweet, and the batter was really crispy as I could hear them frying to order. It's lightly salted and it enhanced the sweetness flavor of the sweet corns. 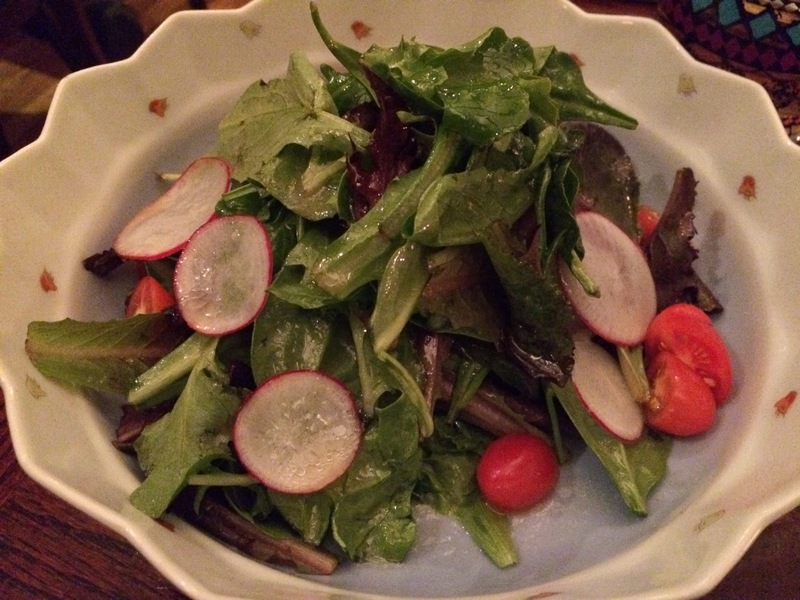 It's lettuce, red lettuce, radish and tomatoes with vinegary oil dressing. After the salad, it took them a while to bring the rest of the dishes we had ordered, but given that the space was almost full, it's not hard to imagine, and maybe the kitchen has limited space, too, like the seating are. About 20 minutes later, the rest was brought. 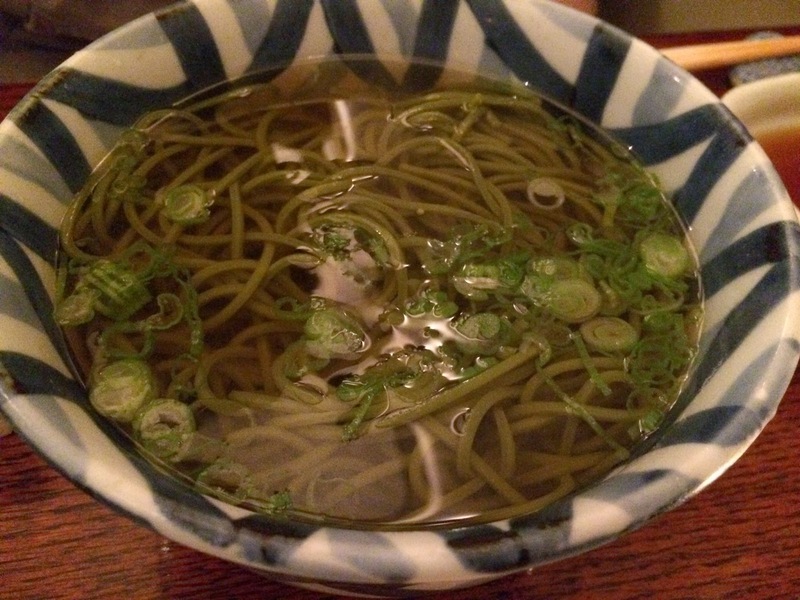 It's a simple hot soba noodles with leeks, and the soba noodles weren't ordinary gray noodles but they're green as it's mixed with green tea. 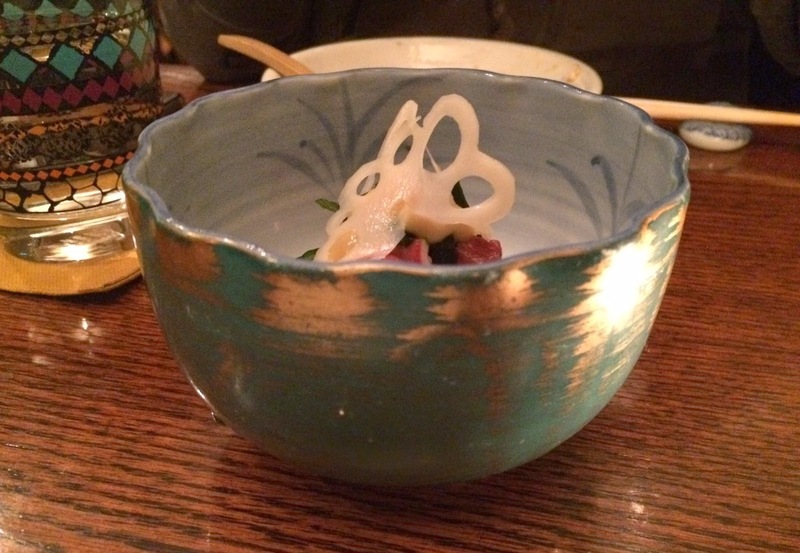 The broth was flavorful (maybe kelp (seaweed) and bonito flakes) but the scent was never too strong. 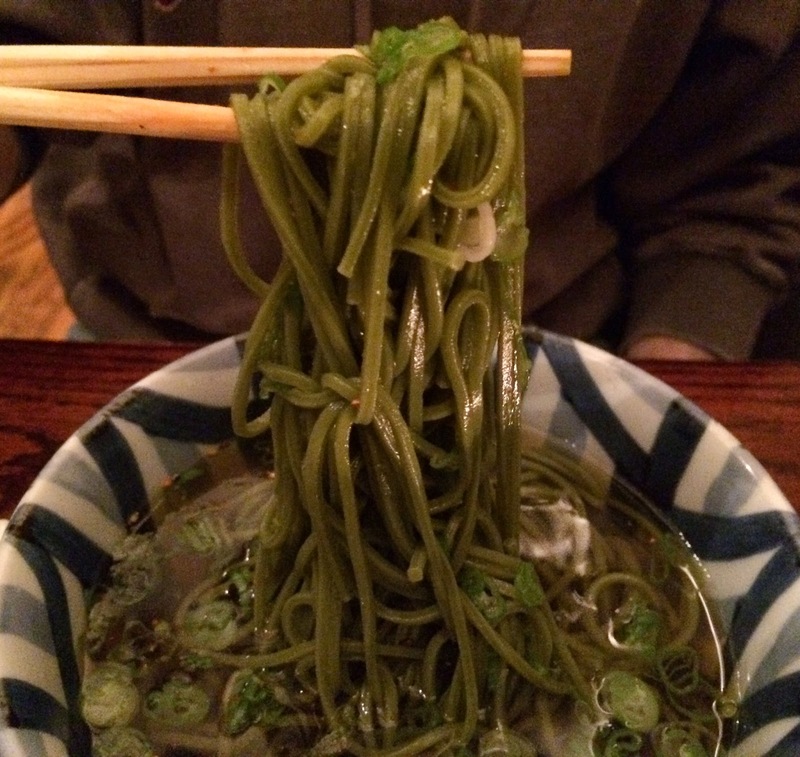 The soba noodles were chewy and al dente as they're in a good way tough and boiled to perfection. 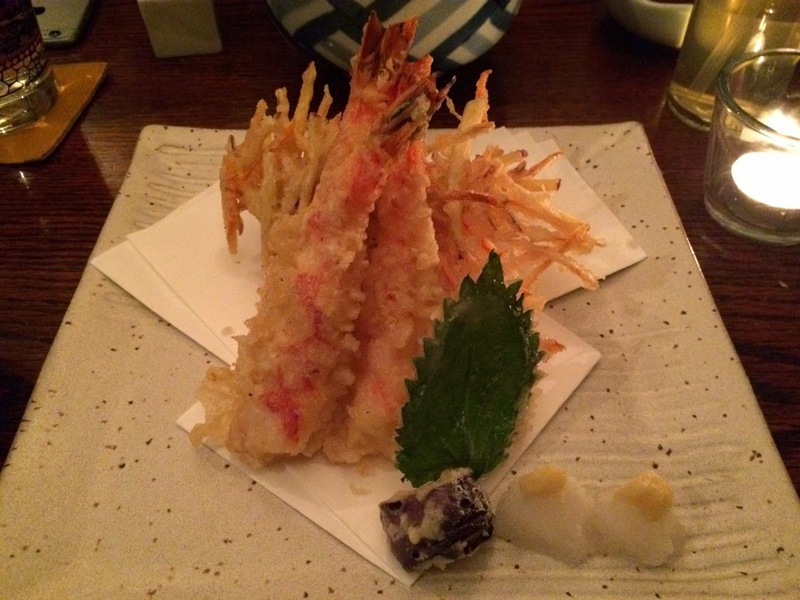 There're 3 prawns, 3 vegetable tempura, a cube of eggplant, a leaf of Japanese basil. The white and yellow objects next to the eggplant were grated daikon radish topped with grated ginger to dissolve in a dipping sauce, which is similar to dashi (broth) soup as it't transparent. 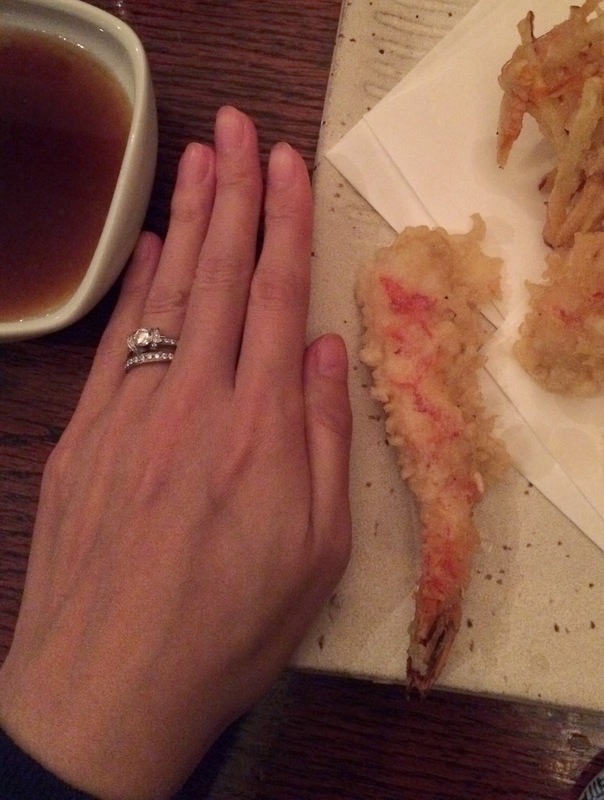 I forgot to take a photo of the dipping sauce, but I like not dipping tempura to keep the crispiness of the batter. 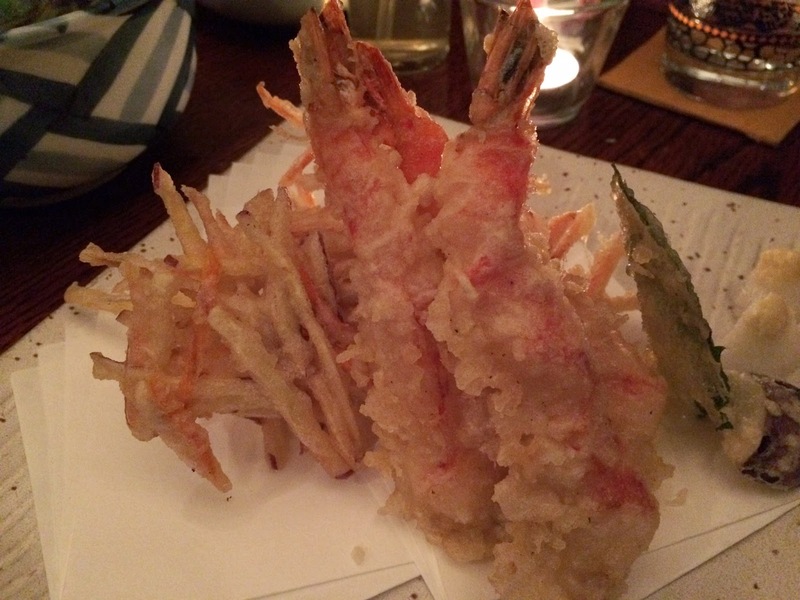 Each prawn was about 10cm (4 inch) long and the prawn was chewy and thick, and the batter was really crispy. The vegetable tempura is called "Kakiage" and the name kakiage (かき揚げ) is coming from the preparation of the dish; Kakimazeru (to scramble up, to stir) and Ageru (to fry). It's julienne sweet potatoes and carrots with thinly sliced onions. 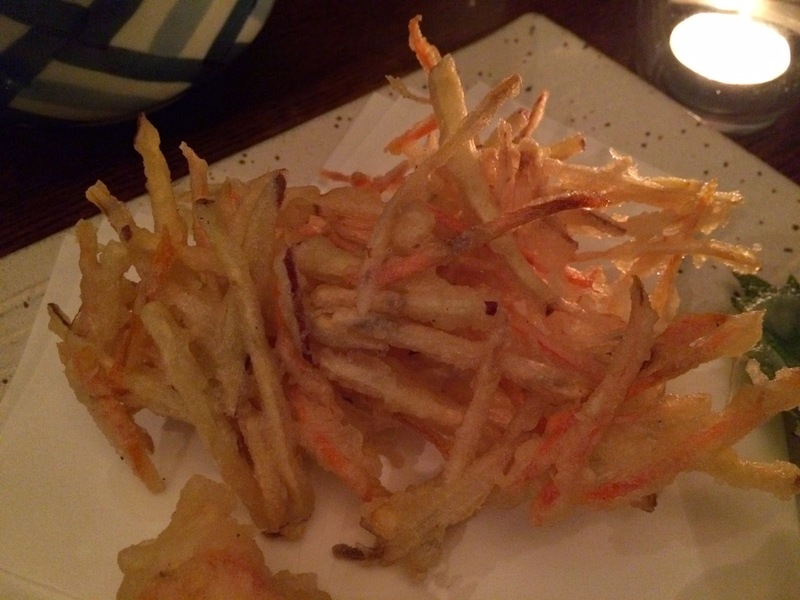 They're crunchy and had different crispiness from prawns. 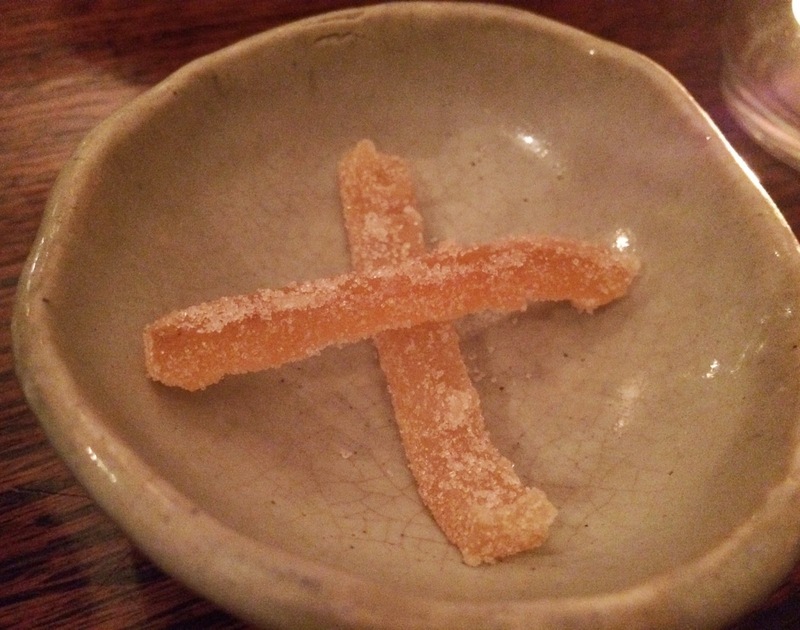 When we got a check, they brought us 2 cups of Hojicha, roasted green tea, and homemade orange candies. 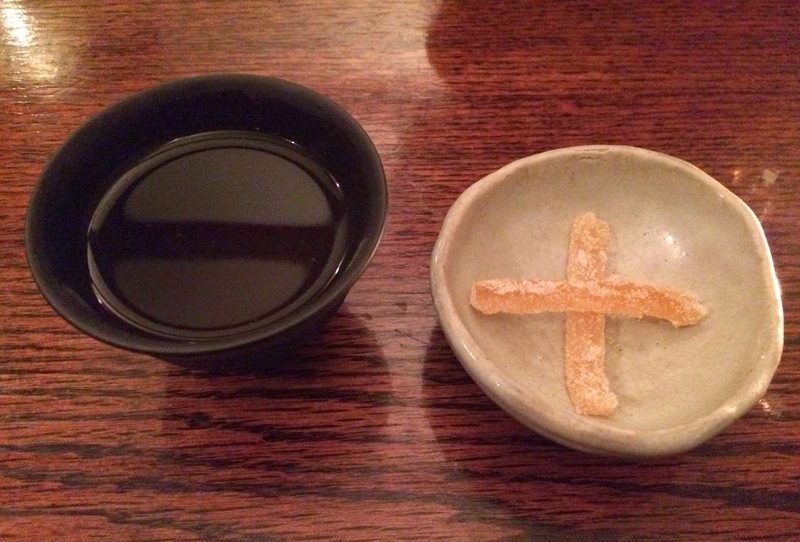 It's orange peels cooked in syrup and covered in white sugar. 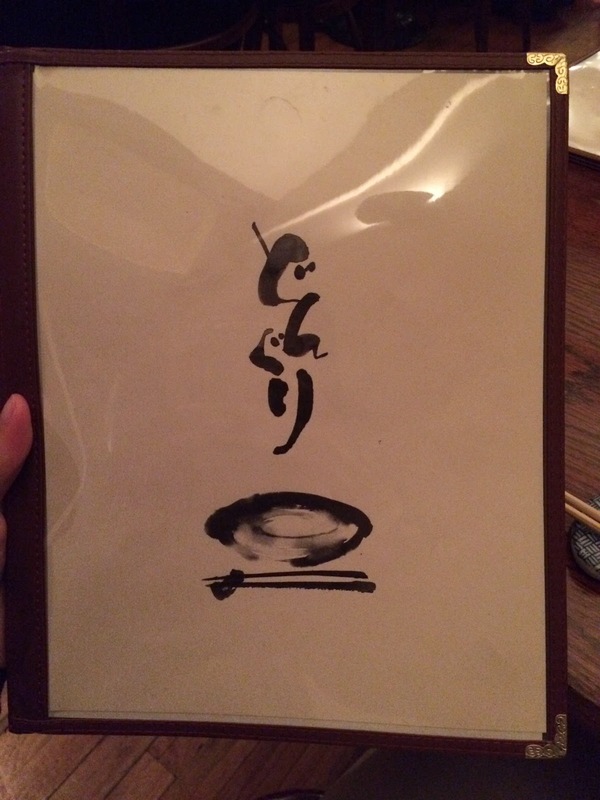 It's been a while since last time I had "real Japanese food" at a restaurant outside of Japan. HP showed the chef was Japanese and I understood fully why the flavor, texture, presentation and even the plates and bowls were almost same as the ones in Japan.